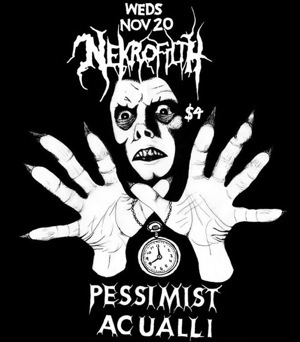 November 20th 2013, Los Angeles CA: For starters, Nekrofilth is a death/thrash/punk crossover group based out of Cleveland, Ohio and features Nunslaughter guitarist Zack Rose as the frontman. Nekrofilth has been around for five years but have achieved a lot more this year alone than during the entirety of their past four, with the release of their debut album ‘Devil’s Breath’ on Hells Headbangers Records, and a West Coast tour to follow. As part of this tour, they played at a secret underground location in downtown Los Angeles last night. The place is virtually non-existent on the map and has no identity, so this is just about as underground as it gets when you talk about live music, and I was massively curious to discover what this show was going to be like. I arrived at this place at around 8 PM, mentally prepared for the adventure that beckoned. But the live music itself was far from starting yet, because first up there was a screening of a classic horror movie called ‘City Of The Living Dead’. I am not a movie fan whatsoever, let alone a horror movie fan, so I could care less about this movie. I left the concert/screening hall and sat in the lobby, and all I could hear for the 90-minute duration of the movie was people screaming. I had no desire to put images to these noises and to find out what was transpiring on that screen. Thankfully, the movie ended at around 9:45 and the stage was ready for the music to begin. Local extreme metal outfit Pessimist was the first band to take this stage, playing a 25-minute set that turned out to be quite a bit more diverse than I was expecting. Aside from standard black metal passages, they had some slow, quiet guitar parts that proved to be a good bridge between the faster segments and kept the music interesting. They had the lights completely switched off and the candles placed either side of the stage were the only sources of illumination, creating an apt atmosphere for Pessimist’s music. They managed to make a positive first impression on a majority of this small audience and provided a solid start to the show. Next up was a band called Acualli who played a much shorter 15-minute set but suffered from sound issues as their vocalist’s microphone kept cutting out. For the first couple of tunes there were no vocals at all. But even with the microphone working, the drums were washing away almost all of the bass, guitar and vocals, which made it extremely hard for the listener to understand or appreciate what this band was trying to do. With that said, to give the vocalist credit, he did succeed in instigating moshpits amongst the crowd as he positioned himself in front of the stage and charged at the crowd on a couple of occasions. Other than that, it wasn’t much of an impressive set and perhaps not the best representation of the band. At this point, the air in the room was getting more and more infiltrated with cannabis smoke. The contact high instilled in me a very strong urge to dig into the pack of Gansitos sitting beside me, but I somehow resisted. Not long after, the headliners Nekrofilth marauded this stage with their dirty punk-infused death/thrash, playing tunes off of the debut album, and even through a 24-minute set which would be considered extremely short for most headline acts, Nekrofilth was able to complete their objective of conquering their Los Angeles fan base, at least the thirty of them that turned up for this show. Their original set was less than 20 minutes but they ended up adding three encore songs as the audience kept demanding for ‘one more’. Mosh pits accompanying the faster parts of the music were a constant feature of this set but the band also presented the slower, doomy element for brief moments in an otherwise unstoppable freight train that trampled this room. All in all, it was great to witness the fury of a live Nekrofilth set, and if this performance is anything to go by, I wouldn’t be surprised to see a lot of Nekrofilth in the near future, on stages big and small.